LAS VEGAS – OpenText CEO Mark Barrenchea elaborated on his decision to pull the company off of Facebook in a keynote discussion with former FBI Director James Comey on Wednesday. In a wide-ranging interview at OpenText Enfuse, in which Barrenchea asked most of the questions and Comey spoke about good leadership qualities, the state of American democracy, and a couple of the differences between U.S. Presidents Barack Obama and Donald Trump, Comey managed to turn the tables to get one question in. After being asked on his opinion about Facebook’s Cambridge Analytica data privacy debacle, Comey said he wasn’t shocked by it and that he noticed OpenText had removed its page from Facebook. He asked Barrenchea why. 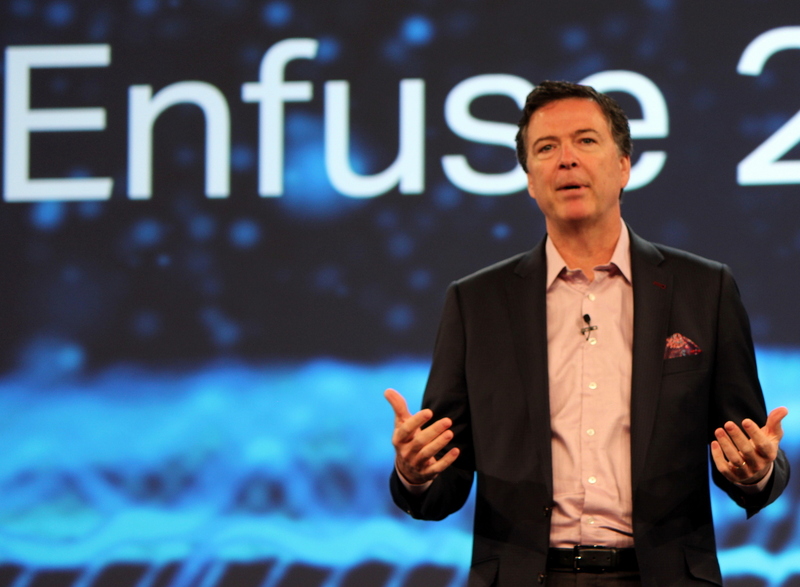 Former FBI Director James Comey spoke about ethical leadership at OpenText Enfuse 2018. Barrenchea first spoke out publicly about removing OpenText’s Facebook page on April 8, in a blog post titled “Data is for the Good.” In it, he puts forward the idea that individuals should own their personal data and that it is not for sale. He commits to not sell the personal information of customers. He also explains that OpenText removed its Facebook presence because “the trust is broken.” Since trust is the foundation of data stewardship, and no one should ever sell it, the firm couldn’t in good conscience be present on the platform. Comey spent much of his time on stage talking about what he considered to be the best qualities in a leader. The former FBI director said that leaders should feel comfortable enough in their own skin to take joy in the achievements of others. They are secure enough to step to the side of the stage as an employer takes the spotlight. He touched on imposter syndrome, a term coined in 1978 by clinical psychologists that describes the fear of being found out as a fraud, despite one’s accomplishments. “Most people have it, or if you don’t you’re an amazing jerk,” he said. Comey said that real listening is more than just hearing the words of another person and understanding them, but sending out cues with body language and facial expressions that you are open and want to hear more. In an effort to send this message at the FBI, Comey wore a shirt and tie but no jacket. He always turned his chair to face a person speaking at a meeting.